I received an email from Google last week. I'm not sure what to make of it. Let me first take a minute and give you some idea of how Google and this little blog are intertwined. The domain name of this blog, basilsblog.com, is registered with Google Domains. This blog is hosted by Google, via their Blogger platform. I could register the domain elsewhere, and I could host it somewhere else, but Google's reliability and pricing are hard to beat. One other thing that isn't directly blog related, but worth noting is that Google also has a Web browser that is quite popular, called Chrome. Oh, and there's a thing called Google Search Console which offers tools that can be handy in checking out and improving your Website. You don't have to be hosted at Google to use Google Search Console. The following URLs on your site include text input fields (such as <input type="text"> or <input type="email">) that will trigger the new Chrome warning. Warning: HTTPS is currently not available for custom domain blogs. Which means that, as long as I'm hosted at Google on their Blogger platform, and have my own domain name, I can't enable https. 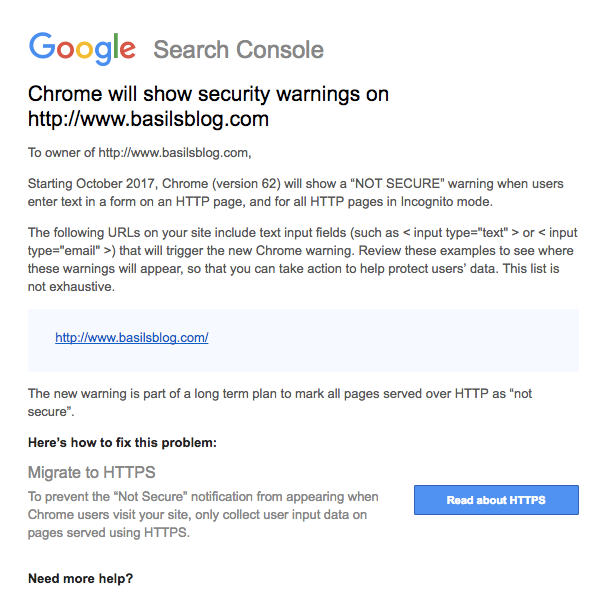 So, all together, this means that Google is warning me that I don't have https enabled on my Website that they host and don't allow https for Websites like mine. Catch-22? Maybe. Or maybe I need to move back to another platform and host for this little blog. Which I don't really want to do. I can hardly wait to see what I decide. Yeppers, it's the same for Your MoM. This kinda nonsense really ticks me off. I was really happy to have everything in one place, and cheaply, too. Now this. The next two months will be fun while I figure out what to do. Give up my custom domain (reverting to https://basils.blogspot.com/) or moving back to WordPress (third-party for ads etc). Grrrr. Just go all in and buy a humdinger of a server and host it yourself. I actually did that a long time ago, before ISPs put restrictions to now allow it. It was, shall we say, interesting. There's gotta be a way to get Teh Google to do this right. If they sell custom domains, they should service them. Does Google Sites work with a custom domain? I should know this because I am a G Suite user. >You can't merge an existing G Suite account with a new G Suite account purchased through Google Domains. >However, any G Suite account that uses a domain managed through Google Domains, can be easily set up with email security features like DKIM and SPF and custom service URLs for G Suite. As for them making it right, that's what I'm waiting to find out. I would expect that they'd offer it as an add-on (maybe not more than $25/year), but perhaps not. I have seen where people have claimed to have used CloudFlare to add SSL to their Blogger Custom Domain sites for free, and I may try that on one of my more obscure domains, just to see what happens.